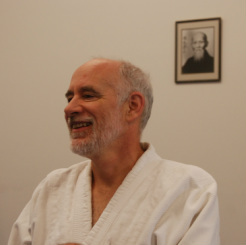 Ned Danieley has been dojo-cho of Triangle Aikido (Choshinkan Dojo) since its founding in 1986. He started training in Aikido in 1980, and was a direct student of Shihan Fumio Toyoda (Aikido Association of America) from 1993 to 2001. 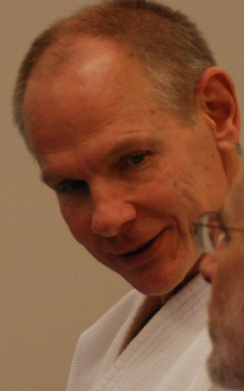 Ned holds the rank of rokudan (sixth-degree black belt) with the Aikikai Hombu. In addition to his Aikido rank, Ned has first-degree black belts in Tae Kwon Do and Modern Arnis, and also studies Iaido and Jodo. Along with his involvement in the formal martial arts, he has taught several self-defense courses, and has assisted in training police and military personnel in defensive tactics. Mark Hazelrigg began practicing Aikido way back in the day. 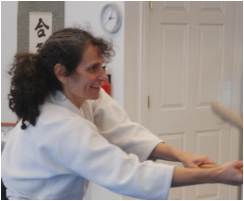 Charlene Reiss began training in Aikido in Greensboro in 1991 before joining Choshinkan in 1995. Charlene is a nonprofit consultant, researcher, volunteer, and parent. Six-attacker randori is her favorite part of Aikido as it's quite a bit less hectic than her everyday life. Jim Seabolt started his study of Aikido in Raleigh when he was in graduate school for the first time, and now his formerly auburn hair is turning white. He has a Ph.D. in Economics und er spricht ziemlich gut Deutsch. Lisa Smith-Rice has been practicing Aikido for many years, but not nearly as long as she's been teaching gymnastics. 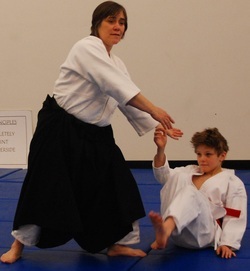 Lisa is the head instructor of Triangle Aikido's Family Class.